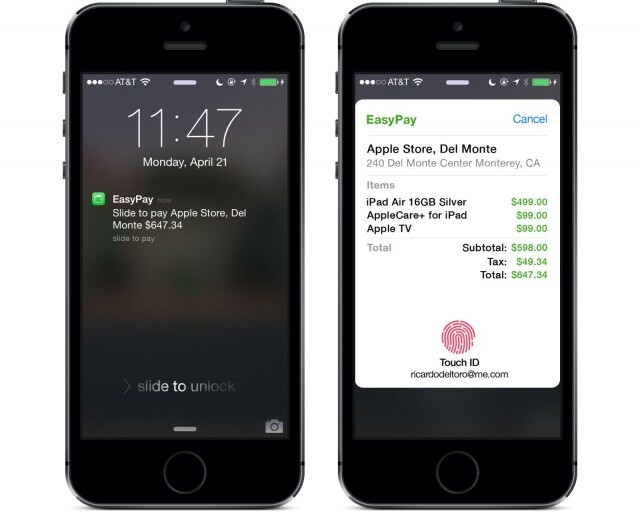 An 'EasyPay' concept that imagines how Apple could handle mobile payments. The iPhone 6 is gearing up to replace your wallet and as part of the initiative to get its upcoming mobile payments system off to a head start, Apple is reportedly in talks with Nordstrom regarding a potential payments partnership. Nordstrom department stores could be one of Apple’s first merchant partners for the new payments platform it will reveal next week, reports BankInnovation, stating the luxury retailer is making upgrades to its mobile point-of-sale terminals as park of a deal with Apple. Partnering with a fashion brand before an iPhone’s release date wouldn’t be new for Apple, which teamed up with Burberry last year to show off the new iPhone 5s camera before it was released to the public. Nordstrom employees say that the company has upgraded its point of sale systems within the last few weeks with new hardware that will allow it to work with the newest iPhone. The report claims Nordstrom and Apple have already signed a contract, but the details of which haven’t been made available to the public yet. Apple is expected to add NFC to the iPhone 6 as a key part of its mobile payments system. Details on how the system will work have been scant, but Apple will likely use TouchID to verify identify, NFC to beam data between customer and seller, and a secure enclave on the iPhone to store all your private financial info.